Chinese filmmakers and experts looked back on 70 years of development of China's film industry since the founding of the People's Republic of China on Sunday in Beijing. This was part of the "Chinese Films Forum for the 70th Anniversary of the People's Republic of China," which is one of the heavyweight events of the 9th Beijing International Film Festival (BIFF). 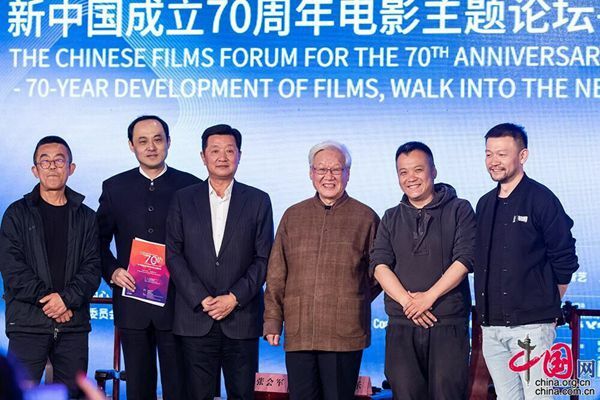 The forum invited directors Ning Hao, Frant Gwo, Xie Fei and many other film critics, experts and film authorities to attend and discuss their reflections on the 7 decades of film development in modern China. Chen Mingjie, deputy chairman of the BIFF organizing committee and director of the Beijing Film Bureau, said giving the festival the theme "Home·Land" was important because "we hoped that through the theme of our film festival, we would promote the patriotic enthusiasm of the Chinese people, as film is the art form that can resonate most with the broadest mass of people." Zhang Hong, deputy president of the China Film Association, believed Chinese film is like a mirror to reflect the progress of the country and the memories of every generation of Chinese filmmakers. "As China develops, the Chinese film industry also grows larger. Now we stand on a very high position in the history of Chinese cinema. " Rao Shuguang, president of the China Film Critics Association, said that though the Chinese film market is booming, it is much more "monotonous" now and needs greater diversity. "We are witnessing a golden era of film, but in this era there are still many unsavory things happening. This includes audiences' irrational consumption and film studios' overly aggressive promotion of their movies. In this era, our larger goal is not just to have a bigger market, but how to become a country with a truly strong film industry." Rao pointed out that during the development of Chinese films, theories were copied from the Western film market. "There are many maladaptive examples, so we have to re-study our film history and traditions, in order to make higher quality Chinese films in the future." Renowned film director Xie Fei, 76, said China has the world's second largest market but still has a long way to go to take good commercial film-making to the next stage, and have a stronger voice on the global film stage. "We saw our great achievements at different stages in the past 70 years. Although we went through a lot of ups and downs, our generations, while inheriting the legacies of the past, have improved themselves, overcome barriers and found new ways forward," he said, adding that the Chinese film industry still needs more reforms. "China has many talents among its 1.3 billion people, and we don't have to worry about a talent shortage. But the system is not perfect and can be improved. We need to always follow scientific laws and continue to reform not just in the creative aspect, but also from the viewpoint of the entire industry." Director Ning Hao said he appreciated the current era of filmmaking and the opportunities that benefit filmmakers, but he noted that China needed better standards to judge filmmaking. "Too many people simply define the success of a film on how it performs in the box office. We should, however, treat commercial blockbusters and art-house films differently. Now, we mix them together, so sometimes it's very strange to hear the market and audiences making their comments on certain films and filmmakers. For example, many people used box office results to measure the success of Jia Zhangke, this is not right and not appropriate." Another director Frant Gwo said that after he went to the United States to study more about the American film industry in 2014, he found a great gap between the film industries of the two countries. "Due to the cultural gap, the Hollywood model does not always fit the Chinese film industry. We need to build our own industry and industrialize every aspect of it." Wu Guanping, professor with the Beijing Film Academy, believed that in the past decade, the most significant thing that had been done was to release the vitality of the industry, which he likened to "releasing the imagination" of filmmakers. "The Chinese government has passed a lot of policies to release the imagination of filmmakers and boost the vitality of the industry. Many young filmmakers went to Hollywood to learn from its experience, which was about releasing their imagination in the aspect of technology," Wu said. "It is very important to maintain the vitality of an industry like ours. After ten years of trying and exploration, we may not yet have a clear answer, but we would have acquired some valuable experience along the way." Also at the forum, Professor Lu Shaoyang, dean of the School of Journalism and Communication at Peking University, announced the publication of The Report on Chinese Film Art 2019. This includes the top 10 list of Chinese films in 2018 by 111 film critics and experts from the China Film Association. The top ten films are: "Dying To Survive," "Operation Red Sea," "A Cool Fish," "Shadow," "Project Gutenberg," "Hidden Man," "Ash Is Purest White," "Ala Changso," "Wrath Of Silence" and "Lost, Found."